Hop aboard a vintage Routemaster bus for the BB Bakery Afternoon Tea bus tour of London. Enjoy tea and cake as you drive past London’s famous landmarks. What a clever idea from the BB Bakery to combine London sightseeing with Afternoon Tea on a vintage bus. Sit down at your own table and enjoy dainty little sandwiches, mini quiches, cupcakes, scones, sweet pastries and macarons and of course, a cup of tea and a glass of bubbles. First launched in 2014, this unique London foodie tour has been so successful that they now offer a gin afternoon tea tour as well. Great for hungry tourists visiting London town in need of a pick-me-up sugar fix. BB Bakery is a very French and classy family-owned Salon de Thé located in London’s popular Covent Garden. Hot on the success of their delectable afternoon teas which come served with exquisite patisserie, they came up with the novel idea of offering a special afternoon tea on a London bus. They welcomed an unusual new addition to their family – ‘Rodney’, a classic 1960s vintage Routemaster double decker bus and lovingly restored him to his former glory. He’s now very handsome and kitted out with tables and seating so weary tourists can sit down in relative comfort and enjoy cakes, sights and sandwiches as he meanders his way around London’s streets showing off his favourite places. Hop aboard the bus at Northumberland Avenue just off Trafalgar Square and from here you’ll be taken on a 90 minute tour of central London and its iconic landmarks. You’ll spot Big Ben, the Houses of Parliament, Westminster Abbey, Buckingham Palace and the London Eye. Travelling back via Kensington and Notting Hill, Rodney will whizz you past Hyde Park, the Royal Albert Hall, Marble Arch, Piccadilly Circus, Nelson’s Column and Downing Street. Thankfully there’s no audio commentary to interrupt your Afternoon Tea experience but if you need to, there’s a handy postcard map so you can see where you are on the route. Sitting in front of a cake stand laden with treats and a flute of pink champagne in your hand, you’ll be the envy of London’s bus passengers as you whizz past them. Served on vintage crockery, the tea includes finger sandwiches, mini quiche, macarons, cupcakes, sweet pastries and particularly yummy brownies. There’s a plentiful supply of tea and a choice of several varieties. It’s served in a reassuringly spill-resistant cup with a lid. Although it’s not the most elegant of tea cups, you’ll be glad of it in the London traffic. If you can’t finish everything during the tour, the friendly bus host will give you a pink cake box so you can take your treats home with you. Tours also depart from Victoria Coach Station. Please see the website for further details. 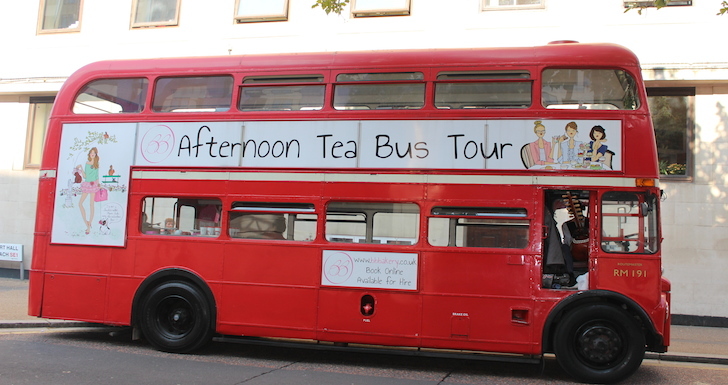 The Afternoon Tea Bus Tour departs from more than one central London location. The main departure point is 8 Northumberland Avenue, off Trafalgar Square, London WC2N 5BY.